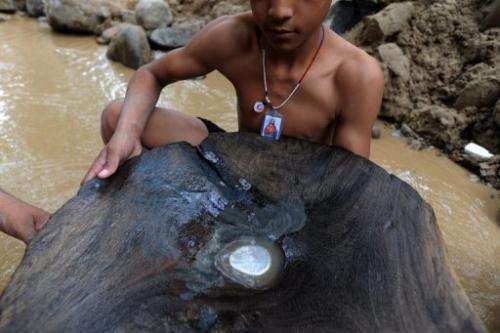 A man shows a wooden basin with mercury to find gold in a creek in the mountains of San Juan Arriba, 130 km south of Tegucigalpa, on February 7, 2012. Crisis-weary developed countries' reluctance to help finance a ground-breaking international treaty to rein in the use of health-hazardous mercury is threatening the accord, UN officials warned Thursday. Crisis-weary developed countries' reluctance to help finance a ground-breaking international treaty to rein in the use of health-hazardous mercury is threatening the accord, UN officials warned Thursday. "Because of the financial crisis ... there's a showdown taking place here," a UN official said of ongoing negotiations in Geneva, speaking on condition of anonymity. Developed nations were dragging their feet on the difficult matter of financing, he said, pointing out that several had objected to being asked to foot part of the bill to help the far harder-impacted developing nations transition away from mercury. Delegates from more than 130 countries have gathered in Geneva this week to try to hammer out the world's first legally-binding treaty aimed at limiting emissions the liquid metal, also known as quicksilver, that affects development of the brain and nervous system and poses the greatest risk to foetuses and infants. While all participants at the Geneva talks seem to agree the use of mercury needs to be phased out in most products, the negotiations have stumbled on the issue financing and how ambitious the treaty should be in terms of the very pricy transitioning away from the metal in industrial processes, participants said. The talks, which are set to wrap up late Friday or early Saturday, are "in the most volatile phase," the UN official said, acknowledging that "there is a possibility that three years of intense negotiations ... could fall apart." He was especially critical of wealthy nations reluctance to pitch in financially, pointing out that "very little money is being demanded," without mentioning specific numbers. The developing countries themselves would meanwhile probably cover some 90 percent of the cost to phase out their mercury use, he said. A participant at the talks, who also asked not to be named, meanwhile described the wealthy nations' foot-dragging as "pitiful", hinting they were only being asked to dish out $30-40 million of the billions it would cost each year to transition away from mercury. The UN's environment programme stressed in a report released last week on mercury pollution that it is not only a health problem in developing countries with high usage, since the metal has entered the global food chain especially through contaminated fish. "It's not aid we're talking about here," a second UN official stressed, also lamenting that developed nations seemed to be clutching their purse-strings. "We're talking about a global health problem."